I love the big chunky necklaces that everyone is wearing these days. The obvious obsession are those Kate Spade statement necklaces, which cost a whopping $428. Kate Spade Treasure Chest Statement Necklace. $428. Treasure Chest, Indeed. I love the sunny yellow color – it’s exactly what I need to brighten up the doldrums of February while I wait for Spring. I may not be in the market for a statement necklace that is quite so spendy, but I am definitely in the market for a pop of yellow. So I decided to make my own, and I think it does the trick. You can make one too – here’s how I did it! Happy Valentine’s Day! Red and Pink! In honor of Valentine’s Day and EBEW’s February Challenge, I am rocking pink and red together today. I actually love red and pink together – it supports my theory that all colors go together! Do you feel the love? Don't make fun of how white my feet are. I live in Seattle. Rocking a cashmere Ann Taylor sweater, Banana Republic blouse, JCrew coat, Banana Republic skirt, and Liz Claiborne Maryjanes. I’ve also put a few red and pink numbers on my Fashion board at Pinterest. 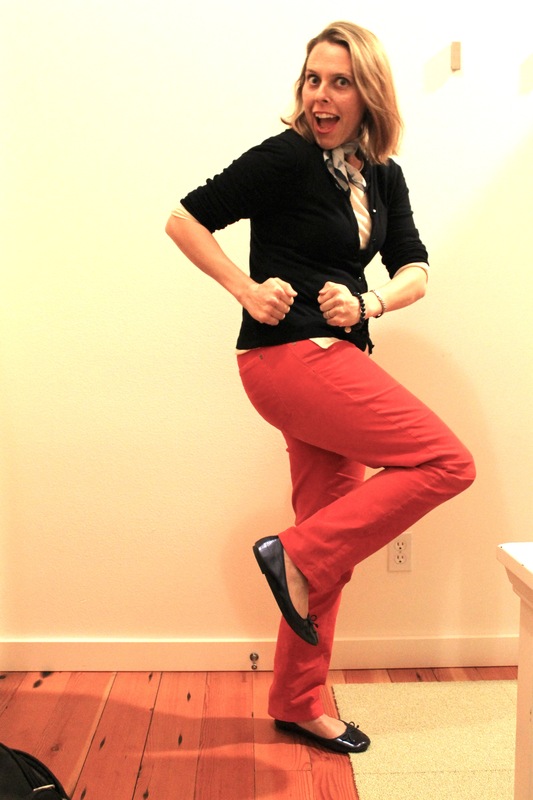 In response to last week’s post about colored jeans, I thought I would show you my power pants in action. Gap red corduroys (I’ve been rocking these for about a year) with a Jcrew cardigan, Old Navy scarf, and cream sweater of unknown origins. Not sure if it’s clear in the pic, but it’s red, white, and navy working together. Because I love America! If that’s not enough inspiration for you, you can always check out my Pinterest Board, dedicated to Bright Pants. I received several texts this weekend from Jessica, who was sorely tempted to buy some bright denim (it was on sale!) but she passed because the fit Just Wasn’t Right – which was absolutely the right decision. Have you rocked some color on your lower half lately? How’d it work out? Do not fear color, my friends. Make room for it in your closet. Exploit the visual bounty afforded by color blocking and the trend for neon. Mix red and pink. Upgrade your neutrals from grey to green. You are an exotic flower. Dress like one! Let’s talk pants! What do you think about bright yellow jeans…are they really hot?